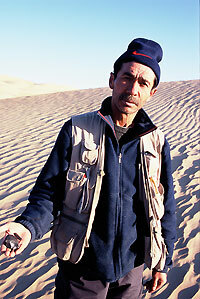 In fall 2003, Christoph Baumer led an archaeological expedition, together with Idriss Abduressul, Liu Guorui, Wang Tao, Therese Weber, and other specialists from Switzerland and Australia, into the Taklamakan desert, Xinjiang, to search for the ancient city of Chümo. The expedition was officially approved by Prof. Sheng Chun Shou, Director of the Cultural Relics Bureau of Xinjiang. III. 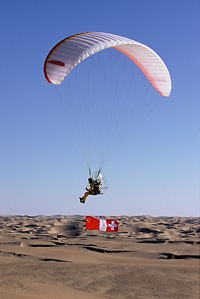 International Taklamakan Expedition. The team (f.l.t.r. ): Wang Lun, Therese Weber, Prof. Idriss, our cook, Dr. C. Baumer, J.D. Carrard, driver, W. Reichen, Dr. Wang Tao, driver, driver, W. Ewig, Dr. Liu Guori. During the long marches, we discussed the preservation of archaeological remains along the Silk Route. The idea then emerged that we should set up a society for the exploration and study of the Silk Route, aiming for cultural goods from Eurasia, whose members would be like-minded scholars. After half a year’s hard work, the sixteen founding members from nine different nations have put this vision into reality on April 16th, 2004. Air reconnoitring in the Taklamakan. Prof. Idriss with two Neolithic finds.